As natural gas becomes more-widely adopted as a transportation fuel, large companies, fleet managers and small business-owners face the decision of which fuel to adopt: compressed natural gas (CNG) or liquefied natural gas (LNG). When it comes to determining which fuel is best suited for which type of application, a crucial decision revolves around fuel storage and tank selection; all engines run on CNG – it’s how to store the fuel that is the key decision, whether as LNG or CNG. In an earlier blog post, we explored the properties of LNG. There are several compelling reasons which make LNG desirable for long distance trucking: it has comparable fill times to diesel, it’s denser than CNG which allows trucks to drive farther between stops, it’s cheaper than diesel in North America and has fewer local air quality pollutants and produces reduced emissions. With the availability and benefits of cold fuel, Westport created a product that allows more fleets to reap the benefits of LNG. 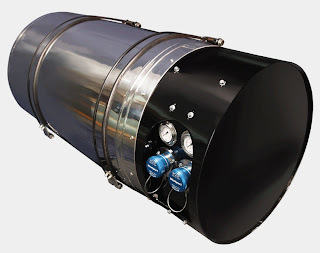 The Westport LNG iCE PACK™ Tank System is designed to work with spark-ignited engines, such as the Cummins Westport ISX12 G and the ISL G.
The iCE PACK system enables fuel providers and fleets to utilize cold LNG fuel at - 240° F (30 psi), eliminating the need for saturating (warming) the liquid in bulk tanks prior to the vehicle refueling process. Unlike other tank systems, it’s designed with a pump that delivers fuel to the engine regardless of displacement or demand. The iCE PACK increases tank hold times up to ten days and provides up to 10 per cent more operating range compared to tanks using saturated LNG. For fleets, another positive aspect is there is almost no fuel loss back to the station during refuelling, which saves money and refuelling time. After refuelling the truck is ready to drive away immediately, as any operator would expect. While there are fewer LNG stations in North America to date than CNG stations, Clean Energy has built 70 LNG stations as part of America’s Natural Gas Highway and the company plans to build another 30-50 stations this year in partnership with Flying J Travel Centers. There are currently 73 LNG stations in the United States, including private stations. Shell opened Canada’s first public LNG this year in Calgary in May 2013. Canada has six LNG vehicle refuelling stations, private and public, and a further eight are planned. As the alternative fuel landscape for transportation evolves, it’s important to consider the available options: LNG may be the best bet for long-distance trucking. The iCE PACK™ can be installed on Peterbilt, Kenworth, Volvo, Mack and Freightliner – on any of the trucks that can be purchased with a 12 L, Cummins Westport engine. To learn more, visit Westport’s website.